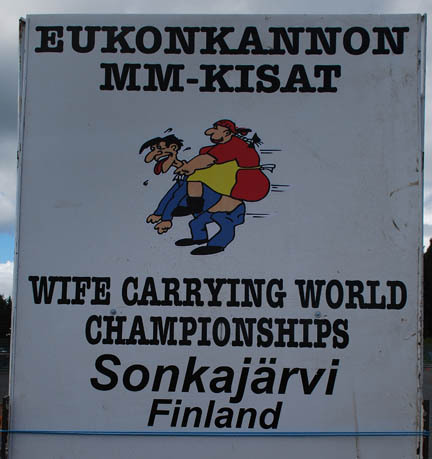 The Wife Carrying World Championships is held in Sonkjärvi, Finland. 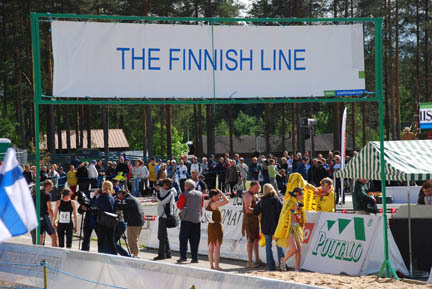 It is a very small town in central Finland that has been holding these races since 1992. But the tradition goes back much farther. In the late 1800's a brigand who was called Rosvo-Ronkainen accepted only men that could carry heavy weights on a challenging track. Also, in those days, it was common practice to steal a wife from a neighboring village. The winner gets his wife's weight in beer as well as other prizes! (Free Beer! Maybe I should have entered.) The track is 253.5 meters (about 240 yards) long and the record is 55.5 seconds. "The wife to be carried may be your own, the neighbor's or you may have found her farther afield..." She must be at least 17 years old and weigh at least 49 kilos (108 lbs.) or she carries extra weight to make 49 kilos. There are four races during the weekend. 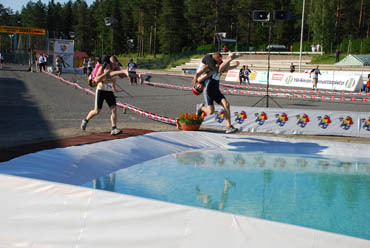 On Friday there is the Sprint of 100 meters through the water hazard and a Marathon around the track for six minutes with no obstacles. 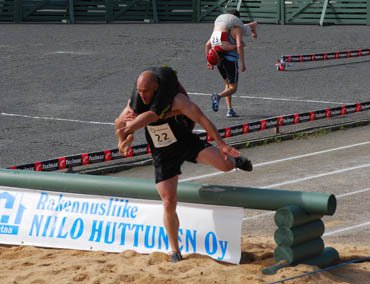 On Saturday is the Team carry where three men share the carry, the first through the water hazard, the second down the straight and the third over the hurdles. But before the next man can pick up the wife the previous man must down a beer, with the last man drinking his at the finish line. Not everyone entered these races. 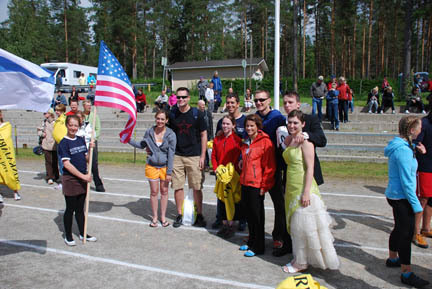 Then there is the World Championship, which a team from Estonia has won the last eight years in a row. 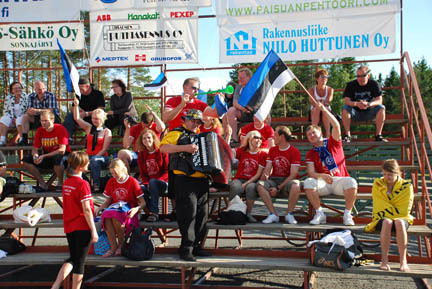 Estonia fielded several teams again this year and brought their own cheering section. The blue/black/white flag is their national flag. And they won again this year despite getting a 15 second penalty for dropping the wife. 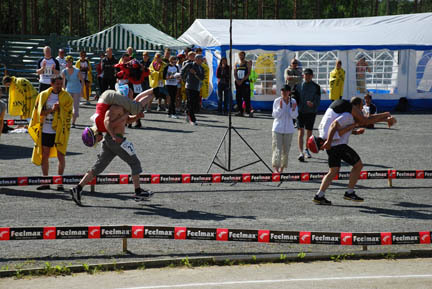 Some people didn't take it as seriously as the Estonians. 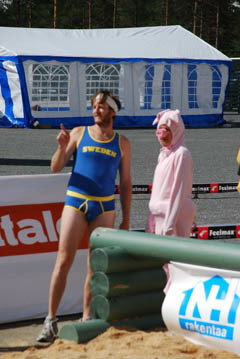 The left hand fluorescent couple is from England, the matador and flamenco dancer are from Finland and the underwear and piggy couple are from Sweden. The American contingent consisted of four couples from Hawaii, California, Massachusetts and Oregon and we were the only cheering section for the Americans. The Oregonians live only 100 miles (160 km.) from our house. 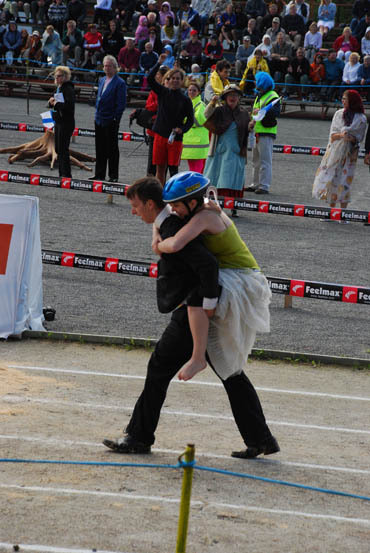 They are wearing their wedding clothes and raced in them. The race course is in the track and field area behind the local high school. 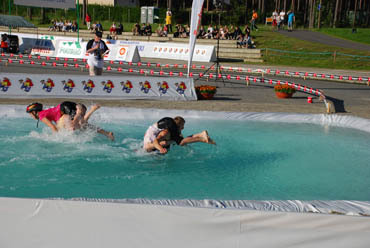 It is an S shape with a water hazard after the first 50+ meters, just before the first bend, then a straight about 100 meters long, the next bend and two hurdles to cross before the end. We noticed that the fastest through the water were the ones whose wife took a deep breath and held on. The ones that pushed on his back and tried to find air to breathe often upset his balance and got dropped. The most popular position by far was the head-down carry with her holding onto her legs. This left his arms to swing free and to balance himself if needed. 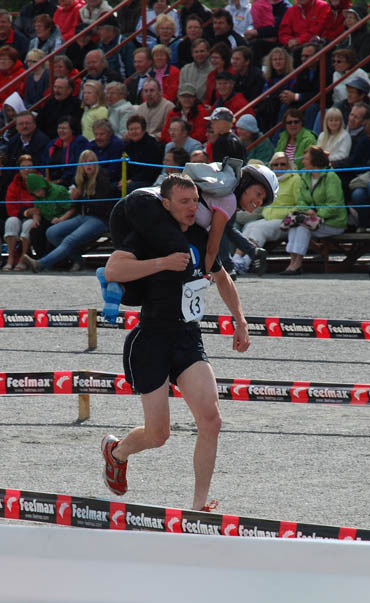 The piggy-back carry (like the Oregon couple did) was also used and there were even some who did a fireman's-carry. 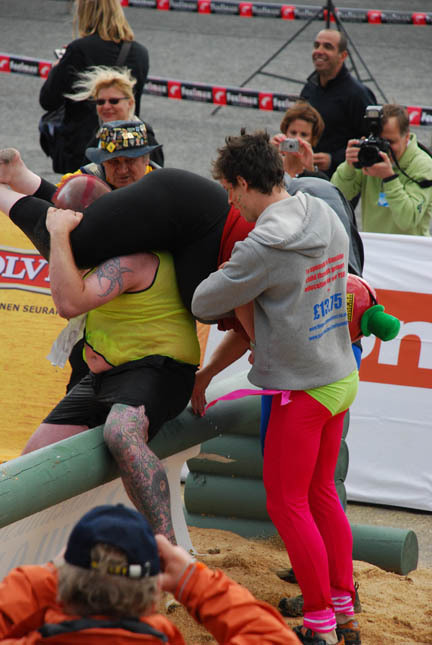 Across all the contestants the head-down was the fastest, then fireman's-carry and slowest was piggy-back. After the second bend there were two hurdles to cross. Some people stepped over them, others were getting very tired and climbed over them with great difficulty. But nobody had as much trouble as this man. This woman from Ireland must have weighed at least 250 lbs. (120 kilos). 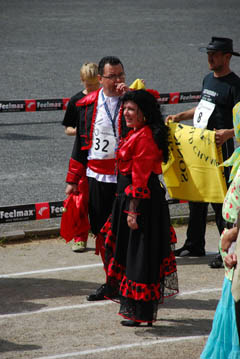 She had been going around the day before, during the sprint and marathon races, trying to get someone to carry her in the championship. This man must have volunteered and he made it into the water hazard carrying her by himself, but needed help to get out of it. Then the other two men helped him carry her the rest of the way. Getting over the hurdles was a real interesting process. They came in last even though they did not drop her anywhere and so received no penalties, almost 5 minutes. One way or another everyone made it to the "Finnish" line! From here we go to the capitol city of Helsinki. There we will visit the city for a few days while staying with a very nice Finnish couple who are the aunt and uncle of a very nice lady that I worked with for many years. We will be leaving the bike with them while we spend two weeks in St. Petersburg and Moscow, Russia. We will take the train there and back.